To give his clients what they wanted, Brown first turned to 3D, and then devised a new strategy for sharing his 3D designs with his clients that would soon earn him even more clients — including clients who loved his vision so much, they bought a $400,000 swimming pool on the spot. 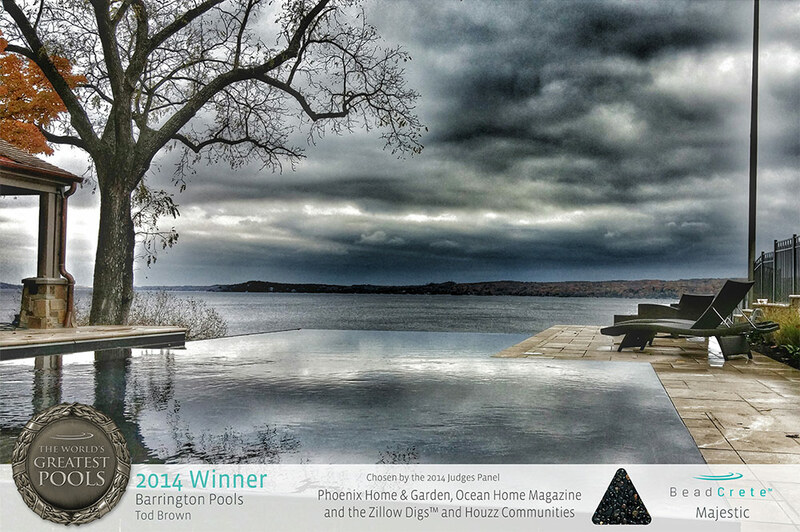 Before Brown began designing pools, he got his start selling residential fences. "What I learned early on was that everybody that was getting a pool needed a fence," Brown says. 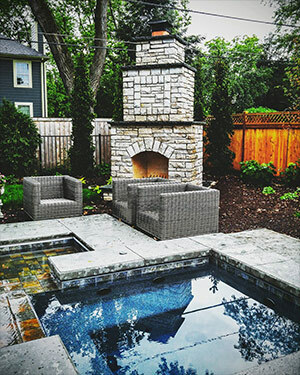 That made Brown pay more attention to everything else clients needed to create their perfect outdoor living space — and he saw a great opportunity waiting for him: "I threw my hat in the ring," Brown says, and began designing pools for clients across Northern Illinois and even into Wisconsin. As he began to design pools, Brown recognized that clients often struggled to understand just what a design was really offering them — he saw that when he used 2D AutoCAD to create designs for his clients, and he saw it again when he supplemented his 2D designs with example photos of similar projects. 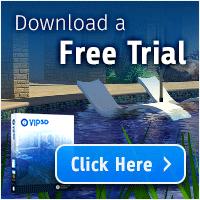 "Most people cannot visualize a 2D drawing in their backyard. So I was using a lot of photos and saying, 'It'll kind of look like this.' It was difficult," Brown says. In order to help his clients visualize his custom designs, Brown decided to take a different approach. "I think I might do my presentations differently than other people with Pool Studio," Brown admits. With Pool Studio, Brown embraces screenshots, background images, and GIS images in order to center his clients in their space before he begins his presentations. "What I've been doing," Brown explains, "is pulling up screen shots of their pool and their house. I'll have about ten of them on my tablet. I'll look out of their back door or back window and I'll hold the tablet and then I'll pull up their pool photo and then hold it up and hand it to them." Once he shows his work to his clients, he gives them a moment to take it in: "There's usually silence for about 15 seconds because they're just taking it all in. I like silence. Silence is awesome," Brown explains. "One woman said, 'Are you telling me that my backyard could look like this? And I said, 'Yeah, of course.' Her husband said, 'All right, I'm writing you guys a check.'" One reason why Brown's clients are so pleased with his designs is because he begins working before he ever steps foot on their property. "The first thing that I do is talk to the person calling in," Brown explains. He asks, "What are you looking for? What's your address?" Then, he says, "I immediately go to Google Earth to see their backyard." Not only does Brown check out the property on Google Earth. He also collects as much information as possible so that he is fully prepared before he meets with the client — while making the process as streamlined and as easy as possible for his clients. After chatting on the phone and getting the basics from Google Earth, Brown then asks his clients to send them their survey. "Around here," he explains, most surveys "are too big to scan." To make it easy, he asks them to simply take a photo of their survey with their phone to send to him. "What I'll do then is look at the database where we have all of the city codes to see what my setbacks are and what any restrictions would apply. I'll have an idea of what I can and can't do before I show up to their house." "I use a lot of GIS mapping systems to get what I need," Brown explains. "This is the Midwest, so, around here it's not really hilly, but I like to know the topography of the property so I know what I'm getting into." Often, the information Brown gathers before the meeting is enough for him to start putting together ideas in Pool Studio to quickly share with his clients. Brown is able to put the information he gathers to good use because he takes the time to get to know his clients as soon as they reach out to him. Initially, Brown says, he simply asks his clients to share a little about what they're looking for. "I ask them to tell about what they want in the backyard. They might say that they want a pool with a spa with a kitchen island." And his clients, Brown knows, simply do not want cookie-cutter pools when they say they are looking for a pool with a spa. In order to help his clients begin to share with him what their outdoor dream space might look like, Brown is careful to pay attention to not just what his clients say, but also to the images that appeal to them. "I try not to talk a lot, believe it or not," Brown says, emphasizing that listening to his clients is far important. "I take a lot of notes. I can ask a few questions and then I have thousands of photos that we have done over the years." Those photos, as well as images he encourages his clients to browse on the social media site Houzz, help Brown and his clients come to refine what it is that they're really looking for: "I start showing photos of projects that resemble what they are describing and I start to get a feeling for their style." 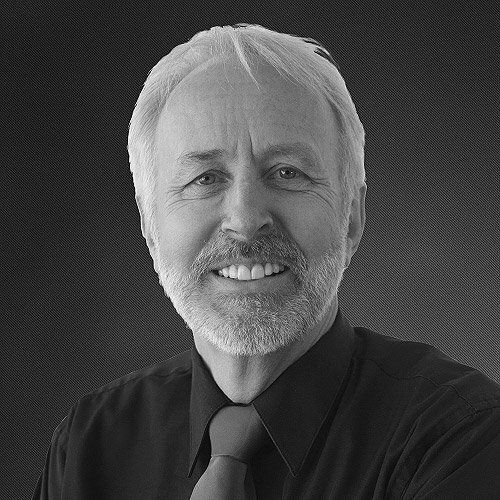 By exploring ideas together with his clients, Brown learns what appeals to them — and gathers the information he needs to complete his design for them. "Typically, after meeting with them for an hour I can walk out of their house saying, 'okay, I have the design in my head, now I have to actually put it in my computer so I can show it to them.'" And to do that, Brown incorporates everything he's learned — from Google Earth images to GIS images, the property survey and the photos that he invites his clients to explore. "Sometimes, if I think it's going to be a simple design, I'll put their house and their property lines in Pool Studio and then open up Pool Studio and say, 'okay, here are some ideas for you, what do you think?' And I can give people kind of a ball park number for what it's going to cost." Many clients are so delighted with his first quick design that they are immediately ready to begin. For Brown, this often happens over his client's kitchen table. "I like to stay fresh and have new ideas and keep innovating," Brown says. That keeps him inspired, even when he spends long days driving to meet clients: "We cover a large area," he says. 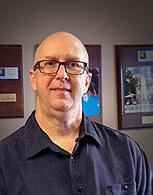 "I live in the Western suburbs of Chicago and I sell a lot of pools in Wisconsin. There's an area just over the Wisconsin border called Lake Geneva. A lot of people from Chicago have summer homes there, so I am driving a lot." Driving to meet his clients means Brown likes to lay the groundwork for his visit beforehand — making certain he's fully prepared when he gets to their property. "I'll leave the house at 8:00 in the morning and get home at 11:00 at night and then do it all over again," he says. While the days can be long, Brown says, "I'd rather go to [my client's] home and see their space. Walk around the space and if I have an idea I can pull it up on my tablet. We can sit around the kitchen table. That's where most jobs are sold, around the kitchen table." Often, Brown uses Pool Studio immediately to create truly unique custom projects that go far beyond what his clients imagined possible. "I like to do very, very unique designs for people," Brown says. "I don't think I've ever sold a cookie cutter design in my life. I try to bring something unique to the table every time I meet somebody. It's all custom." "In my opinion," Brown says, "some of the most challenging back yards are the most interesting backyards to work with because I can do different features that people with a flat backyard cannot do. I often think that the more challenging it is the more fun it is and the more you can do with it." "It's a rectangle with an auto cover," Brown explains. "Then we did a spa that's about the same level as the pool. It's an infinity spa where the water flows over the edges. And then, outside of the auto cover area, I did a lounge area where you can put the Ledge Loungers in about eight inches of water." That feature particularly delighted Brown's client: "She can close up her pool, she can put a cover on her spa, and she has a little area to sit and hang out in the Ledge Lounger with a beverage. It turned out so beautiful. It was one of the ones where I brought in a bunch of people and it just turned out so cool." Many of Brown's custom features are thoughtfully designed to give his clients great spaces to both relax and to entertain their guests. For example, he says, "if there's a change in elevation of about three feet, I put these bars where there are bar stools in the pool and there's a bar top. Then, on the other side of the pool," Brown adds "stairs that go down where people can sit at the dry bar outside of the pool. They can hang out and talk to people that are inside of the pool." "I love to put a can of beer or a glass of wine, a pizza, and then take a screenshot as if you're sitting on a bar stool looking at the pool with a beer in front of you. I say 'This is what you're going to be doing next summer,' and people flip! They think that's so cool!" 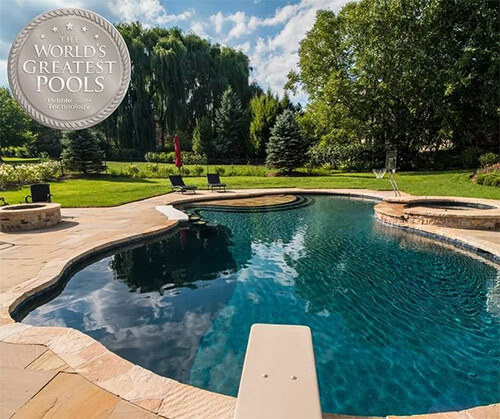 In order to create spectacular custom pools for his clients, Brown relies on his strong partnerships to make certain that the results are as beautiful as the designs he creates. "That sets us apart," Brown says, of Barrington Pools. "We've been in business for 40 years and it's the guys who work for us that actually build the product. … I mean that's the most important thing: can they build the product that I design?" "Sometimes," he jokes, "they give me a hard time about it!" He has built a great rapport with everyone involved in building his clients' custom projects — which he notes is vital to their success. "I do some pretty unique stuff that they've never done before or seen before. I tell them, 'You can do it!'" "What I'll do," Brown says, "is I'll basically interview the customer and let them tell me what it is that they are wanting to do." Then, "if it looks like, wow, this is a big project that I can bring my team in and blow these people away with an awesome design," Brown will partner with the right team to get the job done, including landscapers, landscape architects, or builders. "I'll have the entire team work on [a project] and actually use the fence company I used to work with. They do all the fencing because I know what they sell so I can help sell them. Then I come back to the customer with the full package and say, 'this is what we could do for you.' I don't know of anyone else in my area who really does that. So we've done some pretty awesome projects." 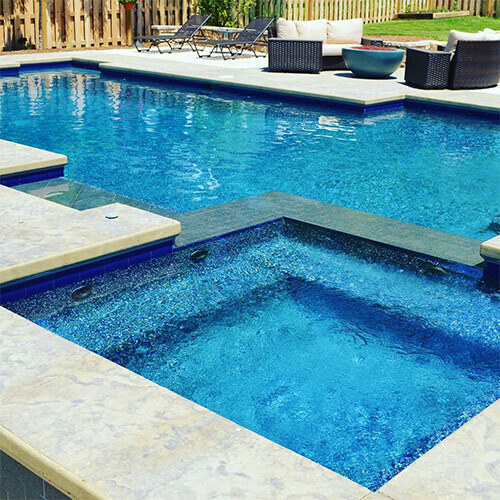 Because he gets to meet so many clients, and work on so many custom pools, Brown pays attention to the trends his customers are embracing most: "Some people are getting more interested in contemporary designs, which I love doing." Those contemporary designs, according to Brown, are often far more challenging — and interesting — to design. Compared to a freeform pool, Brown says, "I actually feel like it's more difficult to do those even though it's a bunch of straight lines." This is because, he emphasizes, "You have to make the lines all work. 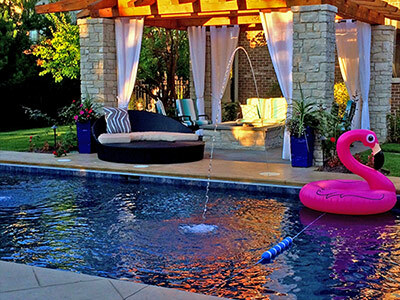 I joke with the other designers that my four-year-old daughter can design a freeform pool." "I enjoy doing the designs really," Brown says. "I enjoy meeting new people. I meet so many different kinds of people and everybody's different and they want something different. It keeps it fresh. No day is ever the same. I'm not bored at all. I'm never bored," he jokes, "unless I'm driving and that's okay." For Brown, the ease of designing with Pool Studio means he can easily change, edit, and even completely redesign projects for his clients. Sometimes, he admits, clients do change their minds — and he always makes sure he can deliver. For example, sometimes, he says, "I think I know what they want to do. I ask them, 'So you want to do a freeform pool?' And they say, 'yes, freeform, lagoon, and water features.' And I confirm one last time that they want a freeform pool." Then, after he shows them the pool he's designed for them a week later — they change gears: "We decided we want a rectangle pool with an auto cover." When his clients change their minds, Brown is ready for them: "You just have to completely switch gears," he says. "People are spending a lot of money," he notes, so "you have to give them what they want." He simply updates his design, incorporating innovative new custom features, and amazes his clients: "I'll go back and say, 'here you go!' and then they buy it." "I really enjoy using Pool Studio," Brown says. "It really helps sell the designs." Deciding to get all of the designers at his company to start using Pool Studio, Brown notes, was game changing: "we all got Pool Studio and it really did change my life as far as designing was concerned." "I really like ... putting a photo of the actual house in the background," Brown explains. "The difficult part of that is trying to take the right photo. What I will try to do is take a picture right in front of the house. Then I'll take a photo of the house from the backyard and both side yards. And I will literally put four photos around this pool design. That's why I like screen shots so much — because I show the shots of the pool with their [own] background." Brown uses GIS images, background images, and screenshots to create exactly the right look for his clients — easily creating a beautiful, personalized project that his clients absolutely love. Give Tod Brown's strategy a try — show your clients exactly how their future outdoor living space will look when you design your next project.